New images of the Tesla Roadster in public have surfaced, this time in an impressive white coat of paint offset by tinted black windows and all black tires. The company’s upcoming electric supercar doesn’t hit roads until 2020, but it’s shown up at an increasing number of events with fans eager to get a glimpse of the future-facing vehicle. 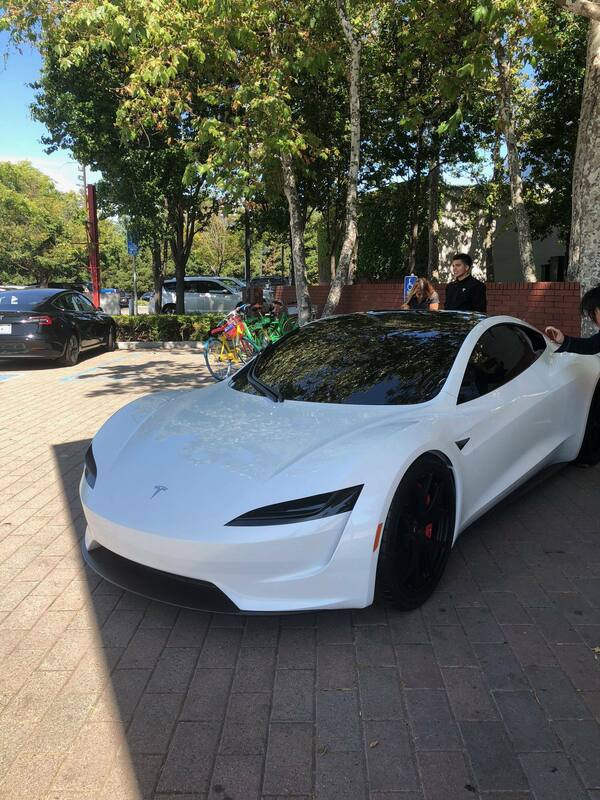 The vehicle appeared in two sets of photos uploaded to the “Tesla Motors” subreddit on Tuesday, by users “LordZeekos” and “EstrangedHippo,” with 6,300 upvotes and 45 upvotes respectively. The latter user, who lives in the San Francisco Bay Area, claims the car made an appearance at the Computer History Museum. This corresponds to the appearance during the June 5 annual shareholder meeting, but image searches suggest these photos have not been shared online before. CEO Elon Musk first unveiled the second-generation Roadster at the Tesla Design Studio back in November 2017, alongside the all-electric Semi truck. The car initially appeared in a fetching red color. In subsequent appearances, the car has also sported a white paint job. Its showing at the Grand Basel auto event in Switzerland, held on September 6 to 9, led to comparisons with the Star Wars Stormtroopers that serve in the Galactic Empire. Unfortunately, visitors at the Computer History Museum were unable to get a close look at the interior. Previous shots suggest the car will use a single, giant touchscreen in the center console, similar to the Model 3 that launched in July 2017. Musk said the console would be used to visualize the “Plaid” mode, a Spaceballs-themed ultra-fast performance mode. Tesla claims the Roadster will offer impressive specs for its $200,000 car. It wil reach 60 mph from zero in just 1.9 seconds, with three motors offering 7,375 foot-pounds of force in an all-wheel-drive configuration, and a 200 kWh battery capable of driving for over 600 miles on a single charge. Of course, this is all subject to change — race driver Emile Bouret described the acceleration time as a “conservative” estimate.